I have a question about transmoging. I would love to use the silent Assassin set on my Monk, i that possible? I know that i can wear the t13 from druids, but not sure about that special rogue set. You can no longer get MoP Challenge Mode sets. They were removed when WoD was released. but thanks for the quick answer. 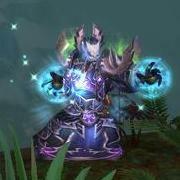 CAn i use the druid and rogue pvp sets on my monk? I don't think so. PvP Sets have class restrictions, just shared items of the same armor types can be equipped by multiple classes (waist, wrist, belt, feet, cloak). If you're looking for a *somewhat* unique /Rogue/ appearance, you should check out non-set pieces from raids. Cursed Vision of Sargeras from Illidan is pretty sweet for Monks too if you want to resemble a Rogue. Keep in mind that some PvP sets have PvE copies - Legion sets are all just copies of PvE sets, WoD has some that are recolors. There's often also a few items here and there, like the shoulders from the Merciless Rogue set.